If you want to build a successful product you need to find problems in a particular market that you can address. In a previous post I talked about how find a market by looking at rough market size and growth trends. Once you find a market, the next step is to get an idea about what kinds of problems people in the market are facing. Honestly, I’m still figuring it out… but I do have a couple of approaches that seem promising. In this article I want to try to find some rough problems in some actual markets. Let’s apply some of these market research approaches and see how they do. As I said, the first step in picking a problem to build a product around is to pick a rough market. You can read my previous post for my thoughts around how I went about doing this. I spent a day researching various markets that seemed interesting to me. Both rough markets have high search volume. Advertisers pay to reach this niche so there is money to be made. Also, I’m fairly familiar with these markets so I’m not starting from nothing. After digging into these two markets a bit I decided to focus on the SaaS market for this article. I felt that my readers would identify better with the SaaS market. It’s more reachable than the BI market. If you have picked a good niche it should be easy to research it. There should be plenty of people and organizations who are also interested in the niche. For this step there should to be forums, facebook groups, blogs etc… that are dedicated to the market. It can be a bit tricky to find proper forums. Broad forums (think business or entrepreneurship forums) will not be specific enough. 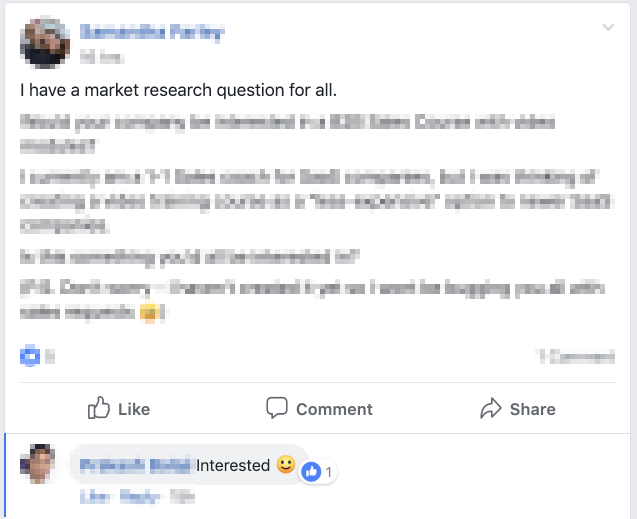 In forums like these there will be casual entrepreneur observers, students, business people of various types etc… It won’t be a very homogenous crowd. This will mean that it will be hard to pick out patterns. You’re really looking for forums where people are asking questions. So far I have found that Facebook groups and some reddit forums have been the best sources of research for me. I used google, reddit and Facebook to find SaaS related forums. My broad market research helped a lot here… that SaaS keyword led me right to relevant forums in most cases. Simple searches were all it took. In the end I knew I had found some pretty good forums. The forums were filled with interesting questions and were packed with other entrepreneurs conducting their own market research. I have found that knowing what to collect can be tricky. You’re looking at a forum and there is SO much data there. What exactly are you looking for? After actually trying to collect detailed data I realized that this approach wouldn’t work. I had yet to pick a specific problem and without a specific problem harvesting details was confusing, frustrating and never ending. So the goal became finding the problems that people in the community face. To do this I harvested and grouped questions. And after collecting and grouping questions themes emerged. Lots of people struggle with getting feedback on their product idea. People are constantly asking for and exchanging feedback. Lots of people struggle with research. Many people outright skip research (and jump right into product development) while others struggle with how to do research. People are struggling with filling in weaknesses in teams… finding co-founders, development help and managing remote development teams. These themes are what I was looking for. Each theme highlights a set of problems a product could be built around. At this point I have a few broad problems people are struggling with. The next step will be to pick one of these thematic problem categories and really dig into how people are currently dealing with the problem. I should ideally see competing products, home-grown solutions, money being spent, and lots and lots of customer reviews. I will leave all that for another blog post.